Sometimes a car comes up where the combination of photography, the car itself, the description, and more all beckon at you. “Look at me,” they say, “I’m beautiful, I run great, and you’ll have fun driving me home. 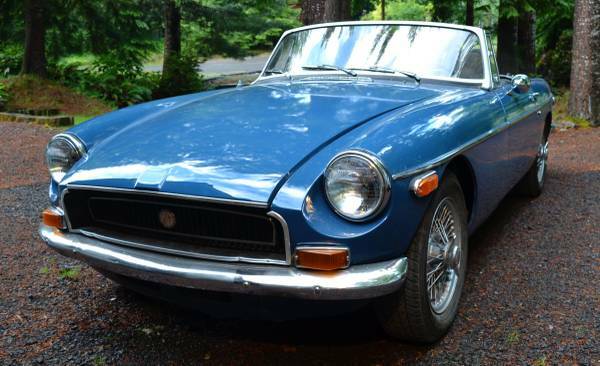 Rescue me from my distant driveway and bring me back with you.” It doesn’t even have to be a car you’ve been searching for, or one that’s at the top of your list – in fact, it’s a more pleasant surprise when you weren’t expecting it. 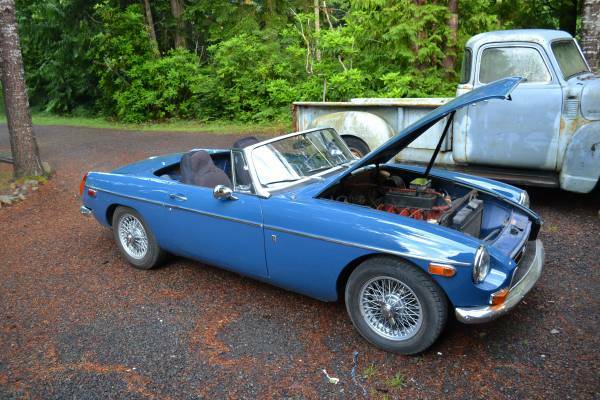 This morning, we have a car like that – check out this 1972 MGB for sale for $4000 in Bremerton, WA. This car, which appears to be wearing the Teal Blue available on Bs from 1971-74, looks to be in great condition with shiny paint, straight enough bumpers, shiny chrome, and the full triple-wiper setup (in case you didn’t know, any car that has one or three wipers is automatically cooler than the normal two-wiper cars). You might notice the hood seems misaligned, but this appears to be just unlatched, since there are other pictures with the hood open. 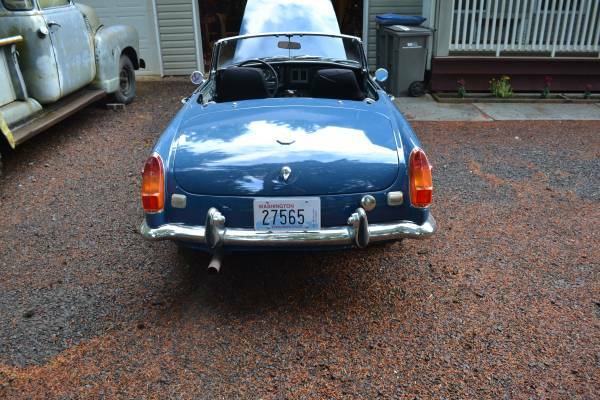 The car is said to come with collector plates (if you keep it in Washington state) and a hardtop. As you can see on this shot, you might need the hardtop in any cold weather, because the soft top looks to have gone missing. The blue works really well with the silver painted spokes and bullet mirrors. New parts in the last year include new brake pads, shoes, master cylinder, calipers, discs, clutch master and slave cylinders, two new tires and five new inner tubes, carpet, windscreen rubber, dashboard, and the aforementioned mirrors. The seller doesn’t give any details on anticipated needs, but in this price range there’s always something, so go in with eyes and ears open. It’s always nice to see a shot of the car running – either the engine with the fan spinning, or the tailpipe with some visible exhaust, as seen here. Hopefully the paint quality lives up to what the pictures promise. Seat covers (and possibly missing door panels) suggest more interior work is needed, but this looks to be a good start to a fun weekend tourer. This entry was posted on July 18, 2014 at 11:21 am and is filed under Feature. You can follow any responses to this entry through the RSS 2.0 feed. You can leave a response, or trackback from your own site. Your market value keeps creeping up. Pretty soon, RBT will be just like BAT. Nice cars that I’ll never be able to afford. You take submissions? 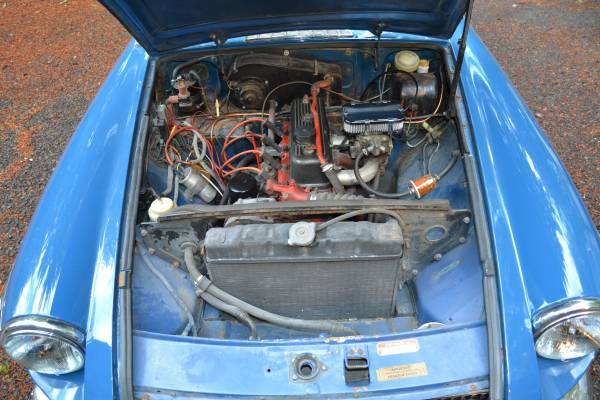 How about an ’80 Fiat 124 spider for a thousand bucks? With an auto trans no less. If you’re interested, I’l go snap some pictures. Duly noted… the casual limit is $4K, so you won’t see much above that, but I’ll see if I can lower the average here. I do take submissions… not so hot on automatics where manuals are commonly available, but if it’s yours and you need help selling it, I’d be happy to feature it.